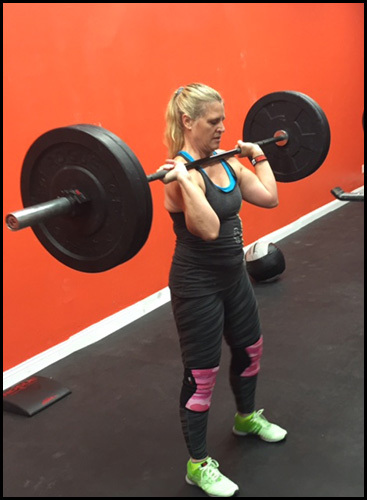 Carrol Petroske started CrossFit in October of 2013. She went into CrossFit with the mindset of getting into better shape and being more fit. Throughout her time with CrossFit, she has attained these goals but says there is always room for improvement. Carrol has been awarded member of the month for a multitude of reasons. Her motivating, hardworking, and inspiring personality is one of those. Carrol comes in everyday with a great mind set to help improve her lifestyle as well as others. That mindset has really taken her places as she has improved tremendously since she has been at CrossFit Fireball. I have one son, Jeffrey. I am an office manager at Massey Services Inc. I am a member of Naples Quilter’s Guild. Anything overhead with a squat. Overhead squats or squat snatches. Good intense workout with family atmosphere and great camaraderie for each other. Gaining new friends and they are always cheering me on during the WOD’s. Many good coaches who help me get proper form on the movements so I can always be improving myself. Keep coming to the box. Don’t feel you are less capable just because you can’t lift or do as many rounds as other people. We all had to start somewhere. I don’t like any kind of seafood.